Horse-Thermotens Pro - JK TOP-Industrial Co., Ltd.
Horse-Thermotens Pro is a unique Horse Massage and Therapie Solution combining sophisticated vibrating motors and heat pads. Placed on the Horse back, covering from withers over to the croup, it will give the Horse a complete and efficient warmed up in depth massage. Precisely positioned on both sides of the spine, effecting the back muscles, are over the entire length 12 Vibrating motors ( 6 each side) implemented inside the blanket. The massage will affect the muscle fibers, warming them up, stimulating and loosen them. The remote control has 4 easy to activate massage programs installed, with different intervals for diverse particular cases. The massage intensity is selectable by user. In addition, the vibration effect will also affect the Blood circulation. Thereby degradation products like lactic acid will be removed, which helps to avoid seizures and IDIO-muscular contractions. Additional and parallel to the Vibrators are 12 Heat pads implemented. 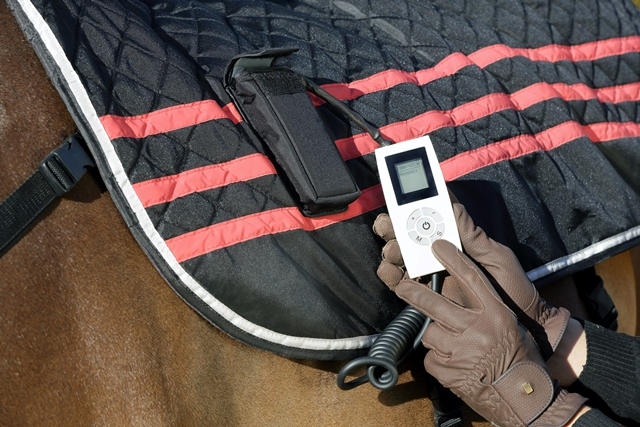 With temperatures adjustable from 15 to 50 degrees Celsius, they will comfortably warm up the back of your horse. Used before working with your horse will reduce risk of injury, helps to relax and your horse will be more focused and considerate. Fully charged the battery operating duration, dependent on temperature and massage intensity level adjustment, will range from 1.5-6 hours. Battery recharging time approximately 60 minutes. Recommended and optional is a second Battery pack . I am using your Thermotens Massage Blanket now for six weeks placed on a few different dressage horses and I am totally exited. Preferred use of the blanket is before preparing the horses to go riding. The individual adjustable massage affecting the muscles to be warmed up and give them a sensible relaxation effect. The warmup period is for my horse noticeable more relaxing. Even used after riding, special after stressful training schedules, the muscles seems to be additionally loosened and a better blood flow helps so to avoid hardening. I usually put the activated Thermotens Blanket on the back of my horse already on the way to a tournament, because my female horse Divinissima hates long ride offs and is truly much faster, more relaxed and ready for the dressage competition .